Background: The global industrialization is fulfilling the demands of modern population at the cost of environmental exposure to various contaminants including heavy metals. These heavy metals affect water and soil quality. Moreover, these enter into the food chain and exhibit their lethal effects on the human health even when present at slightly higher concentration than required for normal metabolism. To the worst of their part, the heavy metals may become carcinogenic. Henceforth, the efficient removal of heavy metals is the demand of sustainable development. 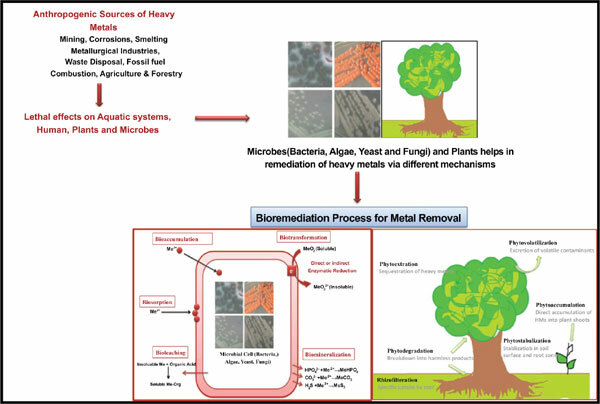 Remedy: Bioremediation is the ‘green’ imperative technique for the heavy metal removal without creating secondary metabolites in the ecosystem. The metabolic potential of several bacterial, algal, fungal as well as plant species has the efficiency to exterminate the heavy metals from the contaminated sites. Different strategies like bioaccumulation, biosorption, biotransformation, rhizofilteration, bioextraction and volatilization are employed for removal of heavy metals by the biological species. Bioremediation approach is presenting a splendid alternate for conventional expensive and inefficient methods for the heavy metal removal. Conclusion: The patents granted on the bioremediation of toxic heavy metals are summarized in the present manuscript which supported the applicability of bioremediation technique at commercial scale. However, the implementation of the present information and advanced research are mandatory to further explore the concealed potential of biological species to resume the originality of the environment. Bioremediation, heavy metals, arsenic, lead, mercury, patents.